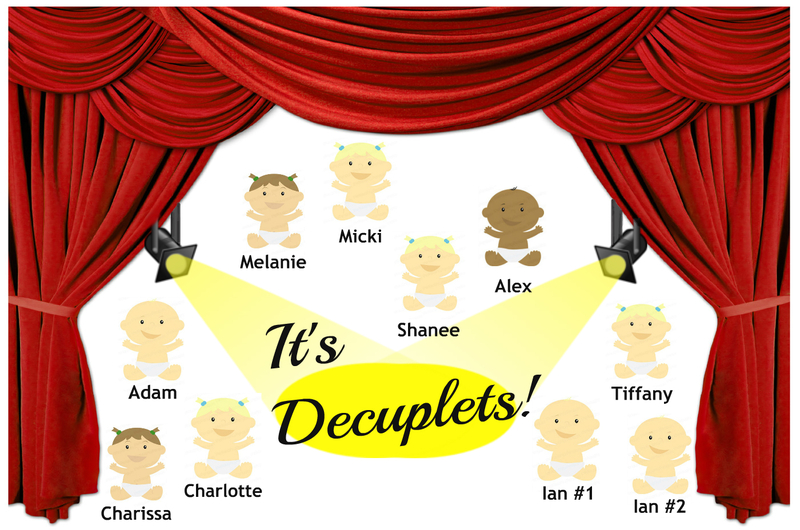 Break out the candy cigars, because after nearly 14 months of gestation, our theatre baby has been born! At just a hair under 2 hours long, thrifTheatre came into the world last night right at around 7:41pm (Yeah, yeah, I had some problems turning off the projector). There to celebrate with all of us proud parents at The@trics and CCJ was a wonderful, supportive audience of around 70 people – and what a celebration it was! Each of the 10 shows was a success, with lots of laughs, lots of conversation after, and lots of folks commenting on how thrifTheatre was unlike anything they’d ever experienced. A former theatre critic (a friend of one of the playwrights) loved the evening and remarked how she hadn’t heard of The@trics before – but that she certainly wants to see more! Don Langford and Karen Murphy – two people who are near and dear to the The@trics Team’s heart – for, being willing to wear 3 different hats over the course of the festival, but for also spending an entire afternoon in the theatre making sure everything was finished off and organized for everyone backstage. Mike Dummeyer and Vanessa Silverstein over at CCJ for helping make sure all of the front of house volunteers and concessions were ready to sparkle the moment our audience walked into First Congregational. Dave Veatch, Andrea Huff, Annabelle Veatch and their family for donating their popcorn machine (and running it for us) so that the moment you walk into Perkins Hall, that wonderful aroma makes popcorn a must! Brown Paper Tickets for making the pitfalls of doing tickets at the door non-existent. If you are looking for an easy way to do ticketing for your event at a venue that doesn’t have the ticketing infrastructure – check them out! The amount of support and gadgets they offer to you is mind-boggling. Our great sponsors, Arizona’s Hometown Radio Group and the Puffin Foundation, without whom thrifTheatre wouldn’t have gotten off the ground. Our wonderful volunteers – everyone from the actors and directors that have put untold hours into this project to the volunteers who baked items for concessions or those who came in to sell them, and in doing so, provide critical support at the time when we need it the most. And of course, Pastor Jane Cheek and the congregation of First Congregational Church. Their enthusiasm and support (both emotionally and venue-wise) has heralded in what we think will be the beginning of a beautiful partnership. Unlike sleep-deprived parents dealing with an actual baby, around the The@trics Headquarters, this morning was one of sleeping in and enjoying that feeling of anxiety being replaced by theatrical pride. The weather looks like it is holding out (while the snow is flurrying and the wind is whistling, the snow looks like it won’t be piling up – but now that I’ve said that, I will go make an offering to the Theatre Gods…) and we’ve already been fielding calls this morning for folks excited about tickets for tonight! The shows will be happening as scheduled – if there are any weather-related changes, we will let you know here. But in the meantime, the show must go on, so come join us tonight at 7:30 or tomorrow at 2:00 and 7:30, and join in the fun! Tickets are available, as always, online at Brown Paper Tickets, in person at the CCJ Thrift Shop, or at the door at First Congregational Church tonight! This entry was posted in Blog and tagged Arizona, CCJ, December, events, Prescott, snow, The@trics, theater, theatre, theatrics, Thrift Shop, thrift store, thrifTheatre, what to do in, Yavapai County. Bookmark the permalink.